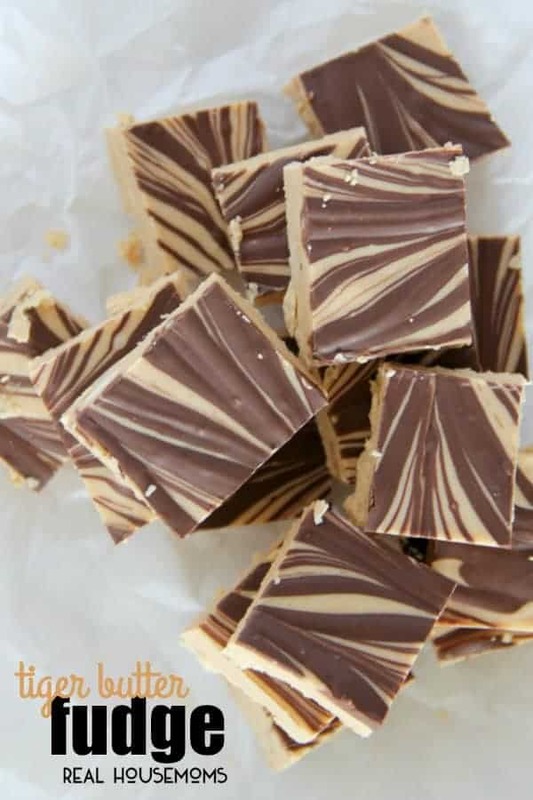 All you need is 3 ingredients to make this addictive Tiger Butter Fudge. It’s the perfect blend of peanut butter and chocolate! If you didn’t know, I love fudge. I love making it, eating it, serving it, and my friends claim that I make the best fudge recipes in the world. Now, I’m not sure I make the best in the world, but I do make some pretty dang good fudge recipes. 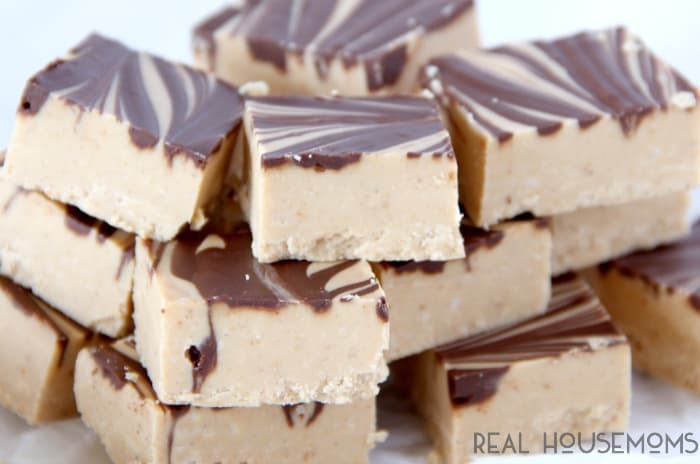 Now this Tiger Butter Fudge has become a family favorite in my house and is quickly becoming my most requested fudge recipe. It has only 3 ingredients, takes about 5 minutes to throw together, but it is so decadent and delicious and it’s hard to stop at just one piece. I refuse to tell you how many pieces I had the first time I made this fudge. Consider yourself warned! There is no better flavor combo than chocolate and peanut butter. It’s amazing, isn’t it. Since these there are only a few ingredients and you are gonna want the flavors to really shine, use the best ingredients you can. Don’t use the cheap the peanut butter. Use a good quality peanut butter that’s just peanuts and salt. And your chocolate, pick a higher quality chocolate because the chocolate flavors won’t be hidden by any other ingredients like sweetened condensed milk. I love making fudge without sweetened condensed milk, but I always make sure to use good quality ingredients when there aren’t any other filler ingredients. Besides chocolate and peanut butter…what are your favorite flavors? Do you have a favorite fudge flavor? I’d love to know what kind of fudge you’re making these days. 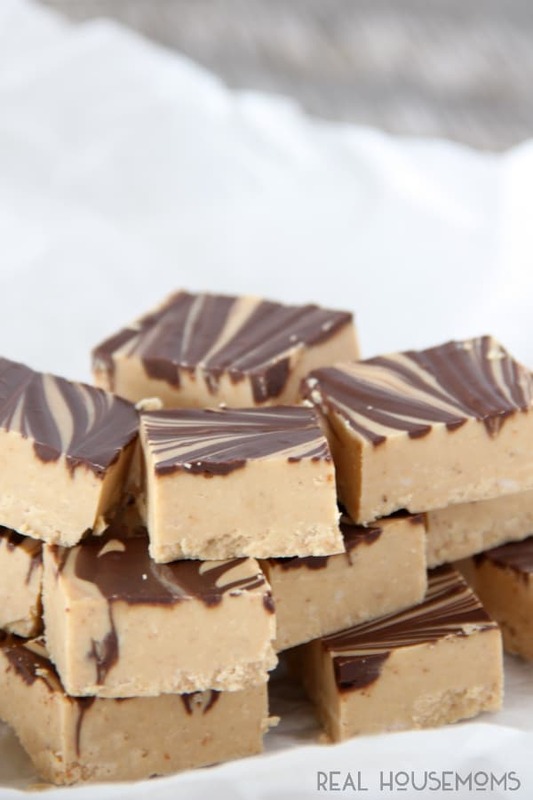 All you need is 3 ingredients to make this addictive Tiger Butter Fudge. It's the perfect blend of peanut butter and chocolate! Prepare a 9x13 pan by covering pan with a piece of foil or parchment paper and set aside. In a microwave safe bowl, heat white chocolate chips on high for 1 minute to 1 minute 30 seconds and stir. Add in peanut butter and heat for an additional 30 seconds. Stir until fully melted, creamy, and fully combined. In a separate microwave safe bowl, heat chocolate chips for 1 minute on high and stir. Return to microwave in 30 second burst until melted. Stirring in between each burst. If chocolate is too thick to drizzle nicely, stir in a tablespoon of shortening to thin the chocolate. Drizzle chocolate in straight lines (in one direction only) over the peanut butter/white chocolate mixture. Take a knife and drag it through the chocolate going the opposite direction from the lines or swirl the chocolate until you are happy with the pattern in the fudge. Let the fudge sit out on the counter for 2 hours to set up. Use a sharp knife to cut into 64 pieces. Peanut butter and chocolate together in one fudge? Shut the front door! This looks easy enough that even a novice candy maker like me can do it. Thank you for sharing — I’m Pinning it!